This is weird, really weird and if you’re into skincare this is going to excite you; actually, even if you’re not into skincare this is still something really interesting. 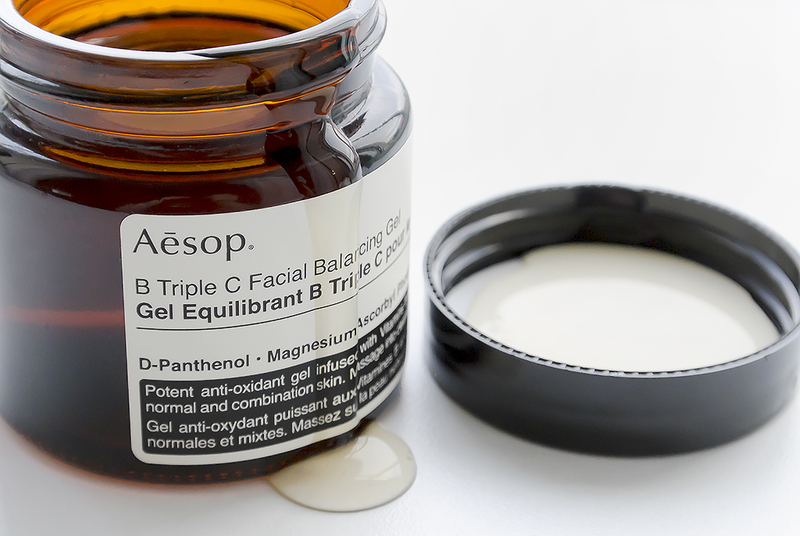 Aēsop B Triple C Facial Balancing Gel is a kind of a mask, moisturiser, treatment and serum all in one. It’s designed to be used once or twice a week, morning or night, to deliver a powerful Vitamin C/B treatment concentrate which actively brightens and balances the skin tone whilst providing antioxidant protection against the elements; Aēsop say it’s great for city dwellers. There’s also bacteria killing witch hazel, skin calming lavender and camomile plus exfoliating lactic acid. The weird thing is its composition and how it reacts when it hits the skin. This liquid gel, when brought into contact with the skin, immediately and momentarily congeals and leaves you thinking “Oh dear! What’s this all about?” as it stiffens. Within 2 seconds, it releases and turns to a watery yet semi-rich gel texture that instantly cools the skin and leaves you feeling all invigorated and tingly (this is just an explosion of adjectives right here, isn’t it?). When you’ve applied the product, it’s a little shiny and a little sticky for say, 20 seconds? Yeah, about 20 seconds I’d say, but during this time, you can actually feel it absorbing into the skin. You’re left luminous, absolutely luminous, with a matte texture and silky smooth feeling but more importantly, hydrated. Aēsop really hit home that this is both mattifying and suitable for oily skin types. Warm the B Triple C Facial Balancing Gel in your finger ends (Aēsop says to do it in your palms but it makes application less accurate as you slap yourself in the face) and then massage into the skin, avoiding the eye area. Aēsop B Triple C Facial Balancing Gel is priced at £81 here from Aēsop and at that price you’d rightly assume that a little goes a long way indeed! This article first appeared on MANFACE written by Thom Watson. It was published on Friday 3rd January 2014 and was last updated on Monday 3rd April 2017 at 3:13pm. It's categorised under Aesop, Moisturise, Serums & Treatments, Special Care where you'll find more related content. Hi Shari. As far as I’m aware, because of it’s very rich, thick gel texture (seriously, in the pot it’s like glue) the actives are encased within the product until they’re released and activated no the skin. I know, it’s a pricey one but definitely worth it, your skin feels incredible after use.